Looking for a simple but very useful gift for your man this year? Look no farther than Schick and Edge shaving products! The high tech Schick Hydro Power Select Razor is great for the man who wants to upgrade his shave. Schick’s most advanced Xtreme3 disposable razor is great for the man on the go, and Edge’s most soothing Sensitive Skin Shave Gel is great for the man who loves his skin. These products have been featured in a variety of outlets including The Wall Street Journal, New York Times, Nylon Magazine, Wired and more. They make for great and affordable gifts. Schick® Hydro Power Select™ is a revolutionary new customizable power razor featuring first-of-its-kind technology including three vibration settings, easy to read indicators and a haptic sensor. 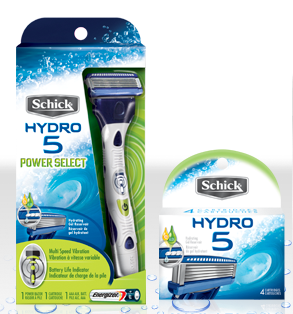 The Schick Hydro Power Select allows men to interact with their razor in a new way, while providing the signature Schick hydration and protection that men demand. Available at food, drug and mass stores nationwide for about $10.99. Reinvigorate your shave with the Schick® Xtreme 3® FitStyle Refresh disposable razor, the only men’s razor with a fresh, clean scented handle designed to fully refresh guys for the day ahead. Available at food, drug and mass stores for about $6.90 for a pack of 4. Give your skin a little TLC. Edge Sensitive Skin contains soothing aloe to help prevent nicks, cuts and irritation. It keeps you looking at the top of your game. Edge® Shave Gel is the original anti-irritation agent, providing men with soothing conditioners, lubricating molecules and a unique of emollients that help enhance razor glide while protecting against the daily irritations shaving can cause. Available at mass, drug, retail and food outlets nationwide for about $2.79.